You need to know how essential backlinks are for those who have real estate websites and/or blogging sites. Backlinks are inbound links that are pointing to your website. In its simplest crudest form, a back-link is a hyperlink (a link that can be clicked on) on a site anywhere else on the web that links back to your site. 1. Inbound links help your pages and posts get listed a lot quicker, which is very important because you want the various search engine bots to discover them as quickly as possible and also continue to crawl them regularly. 2.It's a bit of a popularity contest! Inbound links to your real estate website help your website achieve higher search engine results positioning for the keywords and phrases you have chosen. Quality backlinks indicate who is taking note of your site or blog and the internet search engines will give consideration to your site as being very important and popular. Consequently your sites will likely receive a decent ranking position. Some inbound links carry more weight than others. On the other hand, some inlinks carry no weight at all. A great deal depends on where the link is positioned as well as the type of link that you're getting. Some links will deliver targeted traffic. Targeted traffic is produced by people that do a search for your specified keywords in the search engines and discover your link embedded in articles that you posted in article directories, links on blogs, or a forum posting, usually with a keyword or phrase as anchor text in the link. The article marketing method of link building is especially effective for building high quality backlinks in any niche market. Post an article to one of the many article directories and if it's accepted, the links pointing to your site are do-follow and tend to help give your website 'authority' and moving it a step closer to improved search engine rankings and popularity. Remember, well written articles with a specifically focused competition keyword and an attention grabbing headline are more likely to get accepted. Getting backlinks isn't all that hard, however it is tedious and time consuming, making it a challenge for those who have time constraints. However, a strong and consistent backlinking campaign can reap huge rewards. Most webmasters will not even take the time or effort to acquire free links back to their sites, however those who do, will see the bigger results. Question: Is there a specific number of inbound links you should aim for? Reciprocal links have grown in value again because most major search engines have clearly inferred it to be so. Google puts it in these words: "quantity, quality, and relevance of links count towards your rating." The easiest way to acquire inbound links is to browse the internet to find relevant sites that incorporate similar topics as yours. So, if you write about 'Container Gardening Tips', browse some popular gardening niche sites. If you find the site interesting, make some constructive comments. You could ask the site owner to include your blog/site URL on their site. You do the same for that site owner. There it is, you get a link exchange. You can start getting backlinks using this method, with quite a few websites. The key is to be sure to exchange value for value. Rather than scouring the web yourself, register and search for valuable matches here. While you're there, pick up the free ebook, Make Your Links WORK! which shows you exactly what does produce success in the most time-and-cost efficient way possible, now and for the long term. No tricks. No manipulation. No treadmill. It presents the vital bigger picture required for building targeted traffic, now and for years to come, and for building long-term online profits. I favor the one-way backlinks to my websites mainly because I will likely get more 'link juice'. If you are unfamiliar with that expression, here is the best explanation for link juice that I could find. 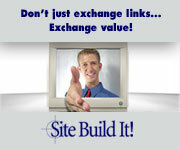 Quality one-way links do generate traffic to your website. This link: http://www.marketing-tools-for-real-estate.com/article-marketing.html is an example of a deep link. The URL contains all the information needed to point to a particular item, in this case the page on article marketing, instead of the home page at http://www.marketing-tools-for-real-estate.com . Deep links that go directly to a site's internal pages increases usability because, unlike commonly used homepage links, they get searching visitors to their preferred destination as quickly as possible. Note that search engines rank each page of your site, therefore good SEO is important for improving pagerank. Getting inbound links is an essential element of search engine optimization. But simply getting a huge amount backlinks isn't good enough. The backlinks you'll need, have to be of quality. Wouldn't you want your website to rank on the first page of all the major search engines? Basically that's what a powerful backlinking campaign should do for you. The marketplace offers an almost endless and confusing array of linking information, strategies and complicated tools, all geared towards helping you manipulate search engines (SEs) in order to improve page ranking and attract traffic to your real estate business. Do your due diligence and carefully research before buying in to these programs. Get 750 Backlinks To Your Site Every Month for Free! It is possible to outsource the process to an agency and end up paying a lot of money... Or you can do it on your own with services like SocialMonkee. SocialMonkee is an instant backlink builder enabling you to cultivate 25 unique backlinks, each and every day, FREE! So, 25 unique backlinks every day... That's a total of 175 backlinks each week, 750 each and every month. Should you upgrade, you would be able to create 100 uniques backlinks, 3 times a day! That's a total of 2,100 inbound links every week, 9,000 every month! The good news is... it's also possible to acquire a Premium Account, FREE! What you need to do is to refer 12 members, and then your account will automatically be upgraded. If you're not at all into referral marketing, it is easy to upgrade for a modest one-time fee. Submitting a webpage to SocialMonkee via the members area takes less than two minutes, however, there is an even faster approach! They developed a Firefox plugin that enables you to submit your page to up to 100 sites in just a few clicks, using nothing other than Firefox. When you've got a Premium Account you'll also get access to link reports and RSS feeds, which are ideal to track your backlinks and get them indexed quickly. Submitting your RSS feeds to RSS submitters is actually a very important part of link building. Backlinking software can be a real timesaver. It can actually create automated backlinks so that you aren't required to make huge adjustments to the code on your webpage. The importance of building quality backlinks as likely one of the most effective approaches to get targeted traffic to your site and should not be under estimated. The time you put into backlink building, whether through a personally developed system of 'one-at-a-time' links from sites or with the help of backlink building systems, programs or plugins your efforts will be reflected in search results and targeted traffic to your real estate business sites. How are you building inbound links to your site? Here are some great Article Marketing tips on the SiteSell Blog.